So now that you have entered to win some woodworking tools from Powermatic, your next step is to enter to win some goodies from their sister company Jet; Walter Meier must be in a giving mood. 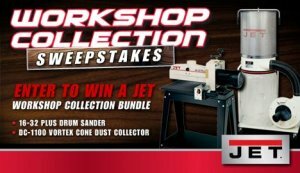 Up for grabs in the Jet sweepstakes is a 16-32 Plus Drum sander that can quickly sand smooth the surface of your materials, and a Vortex Cone Duct Collector to make sure all that dust from the drum sander has a place to go. The prize package is valued at $2,182. "The JET Vortex Cone™ Dust Collection Systems are revolutionary single-stage machines that allow woodworkers to work longer, more efficiently and breathe easier, by capturing and removing wood chips and separating them from airborne dust. Cyclonic action taking place in the lower chamber of these units parcels wood chips from airborne dust and funnels the particulate into the collection bag. This aerodynamically designed chamber and 14 in. cone combination is what drives the JET Vortex Cone™ System, enabling these machines to outperform others in the marketplace. They eliminate performance fluctuations due to premature filter clogging. The JET 16-32 Plus Drum Sander design provides ample capacity to handle small to large sanding jobs with ease. The sanders Sandsmart™ control continuously monitors the load on the drum motor and automatically regulates the speed of the conveyor motor to maintain the highest feed rate without overload. Its patented conveyor belt TRACKERS™ helps reduce the need for manual belt adjustments."